The third part of this series reviews requirements and offers step-by-step instructions on how to clone virtual machine storage volumes. In this series of articles, we will be looking at the new generation of VMware vSphere 4 plug-ins that make it increasingly easier to see your storage from the vCenter/vSphere client. In addition, you will learn how the NetApp Rapid Cloning Utility is not just a virtual machine (VM) copying tool, but also allows you to quickly and easily create and mount new data stores without needing access to the storage management tools. If you've been following along with this series, then by now you've seen that there's more than meets the eye when it comes to NetApp's new Rapid Cloning Utility (3.0). It's not just a virtual machine cloning tool after all. 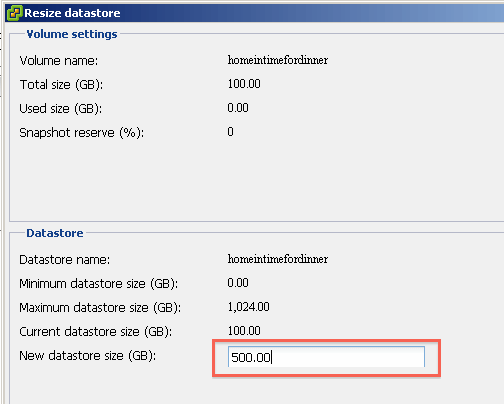 As you may recall, in a previous part of this series I created a Network File System (NFS) volume mounted to my ESX hosts called "homeintimefordinner." RCU can manage those volumes as well. By right-clicking the volume you will see a context menu that allows you to handle duplication settings, resize and even destroy (yes, I know that's a little bit scary) a volume. If you're like me you're forever making your volumes too small for fear of over-sizing them. I do use thin provisioning and deduplication, but sometimes I just prefer a flat volume. That leads me to try to save space by not oversizing the volume. With the NetApp RCU I can fix that issue without having to crank-up Systems Manager or FilerView. All I have to do is right-click the volume, select NetApp, click Resize, type in my new number and click OK. Simple. Ok, dude; calm down. As you might have guessed, one of the main reasons the Rapid Cloning Utility (RCU) is named as such is because it clones virtual machines, well, rapidly! You're just a right-click away from an early home arrival time because so much automation has gone into the wizards. For RCU to really sing, you going to need a couple of things in place. Have no fear, however, as the dizzying number of components and vendors involved with virtual desktop infrastructure (VDI) is more likely to be a source of woes than the RCU(believe me, I've been there). So check off these must-haves. Your broker set and running (optional). A test VM to check that 1, 2 and 3 work. Admin's tip: If 1, 2 and 3 don't work, try connecting directly to your virtual desktop with RDP. If that doesn't work it's a Microsoft problem, if it does work the problem is with your broker or perhaps the virtual desktop itself. 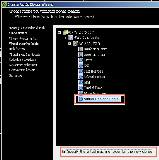 Perhaps you forgot to enable RDP within XP, Vista or Windows7. 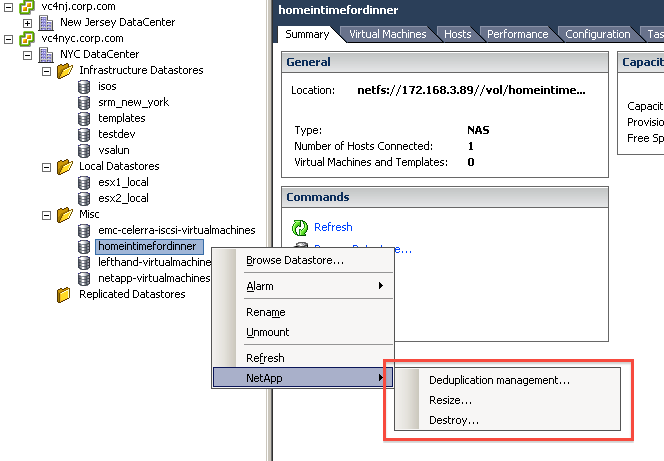 Next, locate your template, right-click it and, in the NetApp menu,select Create Rapid Clones. After selecting your NetApp file as the destination of the clones, the RCU will allow you to handle the metadata that makes up a virtual machine such as Resource Pool, Folder, and so on. 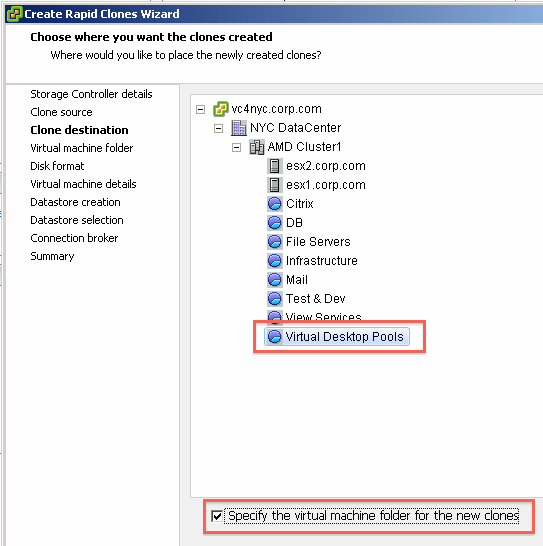 Enabling "Specify the virtual machine folder for the new clones" adds the Virtual Machine folder option to the wizard. You can also select what virtual disk format you need (thick or thin). 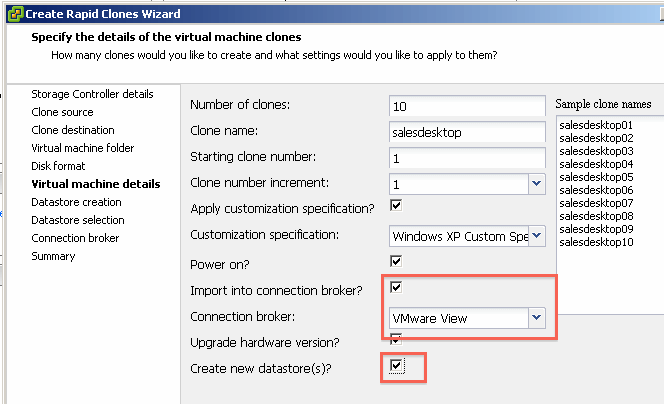 The Virtual machine details section of the RCU wizard allows you to set up how many clones you need; a virtual machine and NetBIOS name; SysPrep and guest customization settings; allows you to choose whether to add the virtual desktops to VMware View or Citrix XenDesktop and asks whether the wizard should create a brand-new data store to hold them. 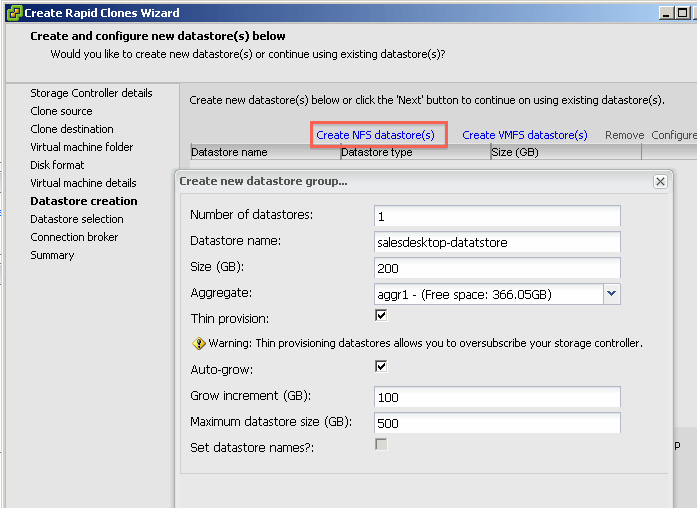 The "Create new datastore" option will allow you to create a deduplicated NFS or Virtual Machine File System (VMFS) datastore with rules about what happens when it starts to become full. 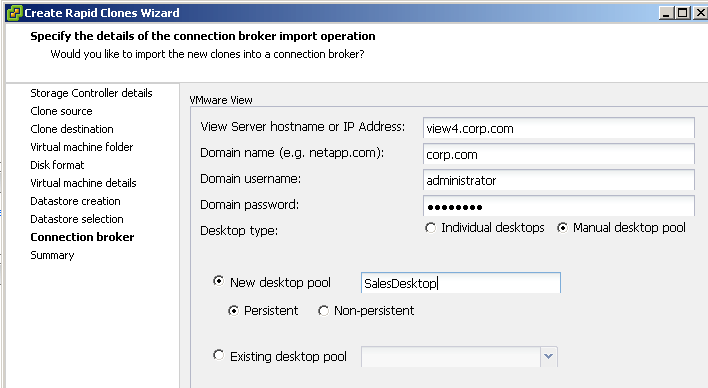 All that remains after this step is to select the datastore and provide the details to your VDI broker, which are needed to advertise the desktops to the end users. In the case of VMware View, you will need its Fully Qualified Domain Name (FQDN) and credentials (I cheated and used the built-in administrator account). Once you click Next and finish, the desktop creation process will begin. First the wizard will create a new datastore, then it will be mounted to the ESX Hosts, and then the cloning process will start. Once the cloning process has completed, it's merely a case of selecting which users should be entitled to use the desktop. Hopefully you've discovered by now that NetApp RCU is more than a simple cloning tool. It's a provisioning tool, it's a storage management tool and it's a VDI deployment tool as well.